AUSTIN, Texas, April 25, 2012 — A small, flexible endoscopic medical device fitted with a femtosecond laser “scalpel” can remove diseased or damaged tissue while leaving healthy cells untouched. When surgeons slice with a traditional scalpel or cut away with a surgical laser, healthy tissue is sometimes removed along with the bad. For delicate areas like the digestive tract, throat and brain, physicians and patients have to balance the benefits of treatment against possible collateral damage. The new medical “lightsaber” designed by University of Texas at Austin researchers helps shift this balance in the patient’s favor. 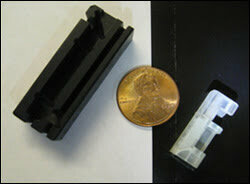 Made from off-the-shelf parts, it includes a laser that can generate pulses of light as fast as 200 fs in duration. Although these bursts are powerful, they are short and do not affect surrounding tissues. The laser is coupled with a mini-microscope for precise control during delicate surgeries. 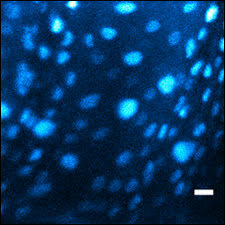 Based on a two-photon fluorescence imaging technique, the specialized infrared microscope can penetrate up to 1 mm into living tissue, which allows surgeons to target individual cells or nuclei. The entire endoscope probe package measures 23 mm long and 9.6 mm in circumference, and can fit into large endoscopes such as those used for colonoscopies. The packaged endoscope overlaid with the optical system. The circumference is 9.6 mm, and the length is 23 mm. Although the system is five times smaller than the team’s first prototype, it has increased its imaging resolution by 20 percent, Ben-Yakar said. The optics includes three parts: a specialized fiber to deliver ultrashort laser pulses from the laser to the microscope; a 750-µm microelectromechanical system scanning mirror; and commercial lenses. To maintain the alignment of the optical components, the team developed a miniature case that is made using 3-D printing. Tabletop femtosecond lasers are already in use for eye surgery, but Ben-Yakar sees the potential for more applications inside the body, including vocal cord repair or removal of small tumors in the spinal cord. The new design has been lab-tested on pig vocal cords and the tendons of rat tails. An earlier prototype was used to test human breast cancer cells. An image taken with the probe’s two-photon fluorescence microscope shows cells in a 70-µm-thick piece of vocal cord from a pig. The scale bar is 10 µm. The system is ready to move into commercialization; however, the device will still need at least five years of clinical testing before it receives FDA approval for human use, Ben-Yakar said. “We are developing the next-generation clinical tools for microsurgery,” she said. 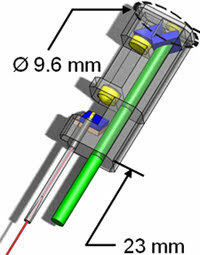 The research will be presented May 10 at the Conference on Lasers and Electro-Optics (CLEO 2012) in San Jose, Calif. This results from the simultaneous absorption of two photons, each having half the energy needed for excitation and requiring a high spatial and temporal concentration of photons. The ensuing confocal effect confines the excitation to the plane of focus. The technique provides longer observation times for live cell studies.